The recent flap over the Virginia grade school textbook that asserted thousands of African Americans fought for the Confederacy brings up a couple of issues of interest to history teachers (aside from the obvious historical issues of race and the Civil War). First, it raises the question of why on earth any school system would buy a textbook written by someone without training in the subject and published by a non-academic press, but that’s about politics, not history, so I’ll skip that for now. Another big question here, though, is the use of the internet for research. Anyone who teaches history today knows that students invariably turn to the web as their main source of information. That’s just what textbook author Joy Masoff—who has no training in history and is best known for her book Yuck! The Encyclopedia of Everything Nasty—said she had done to research the material for her textbook. Just like Masoff, students have no idea whether what they find on the internet is true or false. A good tool for teaching students about the perils of relying on internet sources is to show them these two photos, which happen to address the issue of black Confederate soldiers (and which almost certainly played a part in Masoff’s mistake). 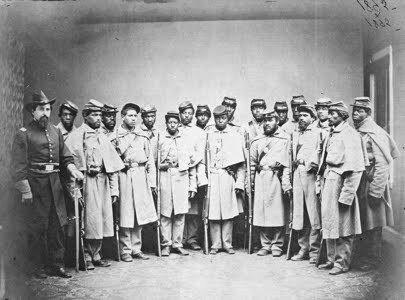 In their paper, they traced how the real photograph of black Union soldiers pictured above was scanned and digitally manipulated into the fake photograph of the “1st Louisiana Native Guard.” It’s a fascinating story. I make it a point to talk the students through these photographs early in my Civil War history class, both to show them that they can’t believe everything they find on the internet, and to indicate just how aggressively modern politically-motivated organizations have advanced false information about the Civil War. Invariably, the students like the comparison of the photographs and the discussion of why someone would want to manipulate an image in this way. And it does seem to have some effect on the degree to which they trust the internet. Good post. I feel a bit bad for the elementary school teachers who made up the committee which reviewed this book, they were almost set up to fail. These state history textbooks are a huge business. A friend of mine bought a house with his royalties. You would think they could afford a couple of historians to look the damned things over. This certainly parallels the Texas textbook controversy. Two of the expert historians who advised on that curriculum were amateurs: the late Peter Marshall (author of the million-selling, evangelical God-and-country history, The Light and the Glory) and David Barton (now a regular on Glenn Beck). Counter-expertise is all the rage of late. It gives new relevance to Richard Hofstadter's Anti-Intellectualism in American Life. My 16 year old daughter is doing a project in her history-ish 11th grade class, where she's been asked to "do" one of Ben Franklin's 13 virtues for a week. She went online and found a list, on a Tea-Party website. We checked, and the high school teacher had not recommended that site; he'd just told the kids to go out and find the info.